This slot game is for all the football lovers out there who are craving a bit of champions league action now the season is over and want to discover more. Soak up the atmosphere of the ecstatic crowd and spin your way through 5 reels of high-octane football mania. This online slot game comes with a bonus scratch card round for you to try your hand at after you’ve scored the winning penalty kick. If you're searching for more, check out the slots here. Even though ElkStudios are one of the newer entrants of the market they have quickly proven they can learn more like a very innovative and creative company delivering always revolutionary products. They bring very unique design choices into their high quality products and always work with a high level of technology. Their repertoire keeps on growing with excellent entertaining products that are all developed with their players in mind. Their games have gained a lot of popularity for their distinct features and engaging mechanics. No football game on today? No worries! With Champions Goal you will still get the entire stadium experience. The slot games online is beautifully represented with realistic paintings of the characters and a gameplay experience that will immerse you right in the middle of the match. Nobody can argue if this game is considered the best spin slots by some players. Today you will see a blue and a red team playing. On the 5 reels you will encounter both team’s supporters (one female and one male for each team) and the numbers of the players that are on the field. You will also see a flare and a not so nice encounter between a fan and a riot copper. Winnings are formed by matching blue symbols from left to right and red symbols from right to left. The Wild of this game is the game's logo. 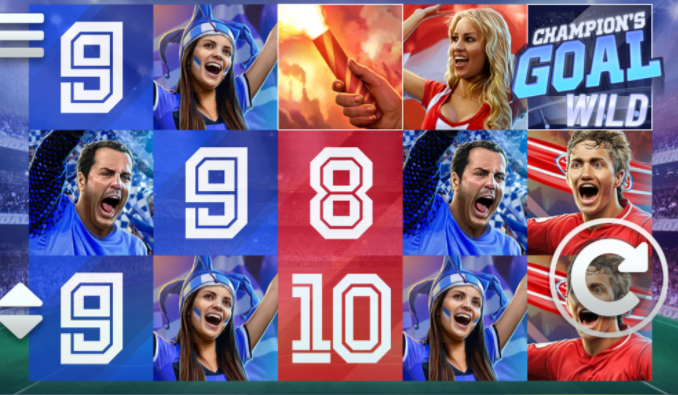 This game is filled with exciting features making you part of this thrilling football game. To trigger the Cascading Tifo feature you have to land a 3x3 symbols combination on the reels in a matching colour. The blue symbols have to be on the left and the red ones on the right, if you see this combination on your reels you will be awarded three free spins and three sticky wilds are added onto the reels for the duration of the feature. Look out for the football! If you land it on any position on the reels you will get to give it a kick yourself. With the Free Kick feature, the ball will clear the entire row it landed on, allowing new symbols to fall into the empty row creating eventual new winning combinations. If you land a payline this way all your winnings are multiplied by 5x. When the pointing referee has to come into the game and will land on any position of your reels he will initiate a mini-feature. Instead of dealing out penalties he will reward you with a sticky wild in each corner of the reels and a free spin to get you some more paylines and nice winnings. Still not enough excitement in the game? Let's get you the Derby Free Spins! Find the bonus symbol, represented by the gold trophy, that is only available on reel three, and land a stack of them in one spin to be awarded seven free spins. When you land more trophies during these spins you are granted extra free spins for up to three times. If you manage to hit the Champion´s Goal during the free spins you will win an instant prize and the spins end. With 20 paylines and lots of thrilling bonus features, this game offers many ways to get yourself some winnings and turn your spins very profitable. To assist to the football game you must bet a minimum of 20p or up to 100 pounds. Champions Goal offers a unique gameplay experience and is absolutely packed with engaging bonus features. The realistic art looks amazing and you will feel like you are in the stadium yourself. Champions Goal has an exciting game feel and may become very lucrative with free spins and sticky wilds in the bonus features. After your football, if you want to try some music then how about you go for our Jimi Hendrix slot?